The 2016 Summer Olympics Games have us thinking about competition and fun in the sports world. We hear the expression playing to win all the time, but we rarely stop to think about what that means exactly. There’s a lot of wiggle room in those three small words. And from the perspective of many of us who live, breathe, and research play, that expression can be an oxymoron. According to Stuart Brown, M.D., the leading expert on the subject, play is purposeless. Engaging in play is voluntary and brings us pleasure. The ultimate outcome of play is joy, boosted by abundant physiological, social, and psychological benefits to our state of being, but these aren’t the reasons we engage in play: We play because it is fun. Can you play to win and still have fun? The answer to that question lies in examination of its converse: Can you lose and still have fun? 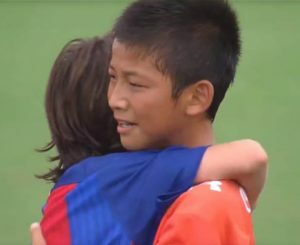 Barcelona’s youth soccer team goes out of its way to console defeated opponents on the Japanese team at a recent international soccer tournament. When we depend on scoring the most points or bringing home the most medals, we become outcome oriented. A focus on the end result can deprive us of the physio-social benefits of play if we lose, or it can boost us with an adrenaline surge if we win. Oddly, both outcomes are stress responses. Our bodies are not designed to exist in constant states of stress. The deleterious effects of stress are well documented and include everything from physical pain, depression, and emotional volatility to chronic and life-threatening diseases. The drive to win rather than be present in the moment can also create an unhealthy pattern of acquisitive thinking—more is never enough. A healthier perspective is that winning is an attitude rather than an outcome. It’s not about accruing the most points. It’s not about taking home a bronze, silver, or gold medal: It’s about showing up fully—being present to the grace of the moment, giving one’s best effort, and displaying respect and admiration for other players. A winning attitude is also one of self-respect and dignity. This is better known as good sportsmanship. I don’t know anyone who plays to lose, but losing is the inevitable outcome of at least half of those in any game. Good sportsmanship makes it possible for everyone to have fun regardless of who scores more points or takes home the trophy. The embrace of winning as an attitude does not mean that we should give every player on the field a trophy. Many of our children were victims of that social experiment and are now dependent on external validation for breathing. We forgot that we can’t give our children self-esteem but we can teach them self-respect by helping them lose gracefully. Learning to recognize a gifted performance is, without a doubt, yet another vehicle for infusing joy into the game. And admiration for the skill and prowess of our opponent—rather than envy or self-deprecation—gives those of us with fewer points the opportunity to experience the joy of awe and wonder, another source of pleasure. The joy of good sportsmanship was beautifully demonstrated earlier this year by tennis champion Jack Sock who encouraged his opponent to challenge a bad call (to Jack’s disadvantage). In the Hopman Cup replay below, it’s hard to tell who was more excited about the challenge: Jack or his opponent. The benefits of true play, as defined by Stuart Brown, are well documented and moving into the foreground of corporate and university culture. Johns Hopkins Magazine’s Summer 2016 issue focused entirely on fun! MIT hosts an annual Sandbox Summit on play. Global corporations are increasingly providing their employees with playshops to encourage more innovative, collaborative and creative cultures. And these benefits are multiplied when we play with others. Joy increases exponentially when we share playful experiences! 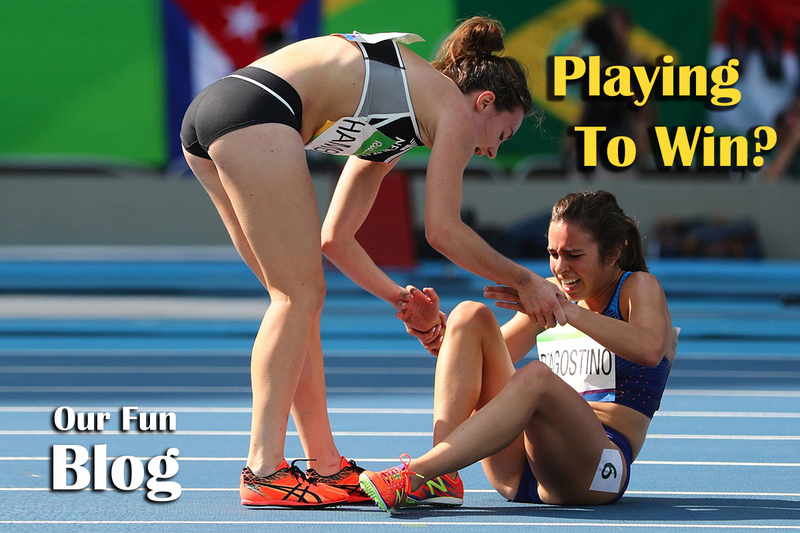 Olympiads Nikki Hamblin (USA) and Abbey D’Agostino (NZ) are remarkable examples of good sportsmanship. Hamblin’s trip and D’Agostino’s stumble and fall, and their mutual support to the finish line, may have been one of the most touching moments of the 2016 Olympics. These two women are a powerful reminder that we can indeed “play to win” but sometimes winning means losing the game.